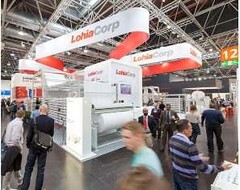 India-based converting machinery maker Lohia Corp had every reason to celebrate at the K. It had changed its name from Lohia Starlinger, as a consequence of Austria-based Starlinger & Co. GmbH having divested its shareholding in the company, and it had thus had a new logo to show off! “The new logo and colours represent the renewed energy, passion for excellence and the italicised characters give the sense of forward motion and rooted dynamism,” explained P.C Joshi, Director of Sales & Marketing. At the show, Lohia showcased a range of solutions for the production of flexible plastic woven fabric packaging for a wide range of applications like bags, sacks, and tarpaulin, FIBC (jumbo bags), carpet backing and leno bags. “We have a full machine line up, including a new modified extrusion coating machine for coating of flat/tubular fabric with PP/LDPE, with a working width of 1,600 mm and speed up to 150 m/minute.” This machine is supported by the circular looms for weaving tubular or flat fabric from PP/HDPE tapes and a conversion machine for bags, with an output of up to 45 bags/minute, said Joshi. Another highlight is the Autoroto tape winder, for winding flat/fibrillated tapes of different widths with speeds of up to 600 m/minute. It has been upgraded to enable automatic transfer of tapes from a full package to an empty tube. In a post-K show release, the firm indicated that it received over 350 active enquiries from prospects from almost 75 countries. The firm has a facility in Kanpur, India, and in Guangzhou, China, supported by a worldwide distribution network with sales offices in Brazil, US, Middle East, Indonesia and Thailand.